The wheat program focuses on breeding primarily in the soft winter wheat market class for improved yield potential, agronomics, adaptation, disease resistance, abiotic stress tolerance, and end-use quality for production in Michigan and the Great Lakes region. A critical component of our program is the study and implementation of disease resistance into our new varieties. In the Midwest, major diseases include leaf and stem rusts, Fusarium Head Blight (FHB), Stagonospora and Septoria, powdery mildew, and bacterial streak. The occurrence of new virulent races pose a serious challenge for breeders around the world, and new sources of resistance are needed to keep pace with evolving pathogens. With the cost of genotyping rapidly declining, the paradigm has shifted from large scale phenotypic testing to extensive analysis using molecular marker data. By identifying markers that are highly associated with loci linked to resistance, breeders can rapidly and accurately select for multiple resistance traits simultaneously to improve resistance and enhance durability to the evolving pathogen. Our lab is using molecular marker technologies to map resistance genes for a number of diseases, and incorporate them into our varieties to help Michigan growers. Fusarium Head Blight (FHB), also known as Scab, is fungal disease that effects the head and grain of wheat. It is one of the most serious diseases worldwide and is responsible for billions of dollars in damages. Along with yield loss, Scab produces the mycotoxin deoxynivalenol (DON) also known as vomitoxin. Excess concentrations of mycotoxin can result in unmarketable wheat as it is a danger to human health. Our group is committed to discovering novel sources of resistance against FHB, and incorporating them into Michigan varieties. As part of our breeding program, all elite material is subjected, along with entries from the State Variety Trial (see below), to extreme, artificially induced FHB pressure in an isolated, misted field location. Notes are taken on disease incidence (how many individuals become symptomatic), disease severity (how serious an individual infection is), and percent Fusarium Damaged Kernels (FDK). In 1997, the US Wheat and Barley Scab Initiative (USWBSI) (http://www.scabusa.org/ ) was formed to help coordinate and implement nationwide research and solution to aid growers, millers, and food processors in the fight against FHB. USWBSI is a close partner with the Wheat Breeding and Genetics Group in our efforts to breed resistant. Since wheat is used in a number of food production processes, it is essential that harvest-quality parameters are met. Pre-harvest sprouting (PHS) occurs when wheat grain germinates prior to harvesting. During this process, the enzyme alpha-amylase becomes active and breaks down starches stored in the grain. This reduces flour quality and yield, ultimately hurting both the producer and the consumer. Because genotypic data is become more readily available, the need for meaningful phenotypic data has risen dramatically. This requires both extensive time and money. To address this, our lab has devised a novel high throughput method to screen PHS phenotypes. This procedure, in conjunction with marker data, will enable us to identify the underlying genetic loci associated with PHS and select for resistance to it. A slow rate of genetic gains has negatively impacted the wheat industry as a whole, and new sources of variation are needed to reverse this trend in the coming decade. One solution to this problem is the use of wide crosses into different market classes or unadapted material. These generate new allelic combinations or reveal new alleles which can be implemented into the next generation of elite cultivars. Hexaploid or common wheat contains six sets of chromosomes which segregate independently in three genomes known as the “A”, “B”, and “D” genomes. Crosses between common wheat (AABBDD) to the diploid progenitor of the D-genome Aegilops tauschii (DD) require embryo rescue and two consecutive rounds of backcrossing in order to produce fertile, hexaploid offspring. However, these offspring (BC2F1) – which we call the DNAM population- can be used to analyze the unique contributions from the D-genome to yield, regional adaptability, disease resistance, and quality. Our lab has already used the DNAM population to identify a number of novel resistance loci for stem rust, leaf rust, and powdery mildew, and research is actively proceeding to uncover more. Furthermore, we have begun testing for yield and regional adaptation. 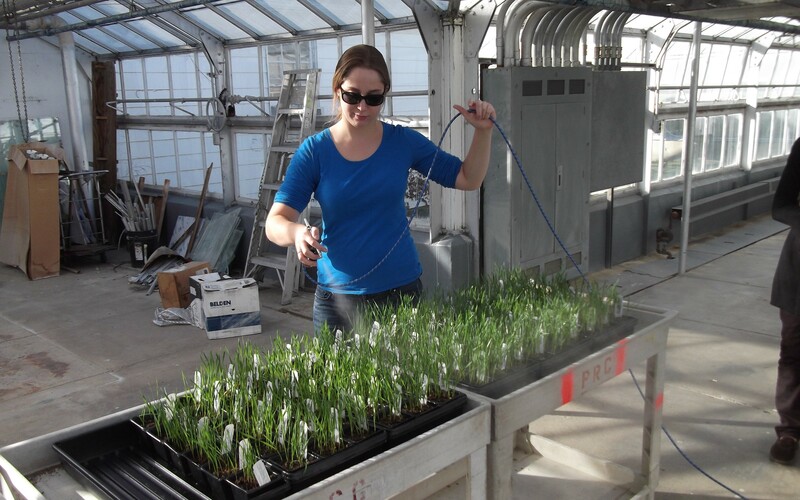 As a service to the Michigan wheat industry, the MSU Wheat Breeding and Genetics program conducts statewide testing on material submitted by public and private entities in the region. Each line is tested in multiple locations (3 replications per location) including replications under intensive management. Extensive data is collected on each variety including flowering date, plant height, yield, test weight, lodging, and disease resistance. Furthermore, all entries are subjected to our misted Fusarium Head Blight (FHB) nursery where incidence, severity, and DON levels are reported. Please see the Variety Trial page for more information.